In Australia, there are many things that take your breath away, but a punch in the paunch by Mike Tyson and seeing the desert in bloom have to be top of the list. Australia’s arid centre so seldom sees rain that house builders don’t bother with gutters, because when it does rail the deluge descends so quickly that gutters wouldn’t cope anyway. A large part of the interior of Australia is made up of the Western Plateau, a vast arid tableland covering most of Western Australia, South Australia, the Northern Territory and part of Queensland. The landscape is generally flat, but it is interrupted by some spectacular features like Uluru and the Kata Tjuta, and rugged ridges like those of the Macdonnell, Flinders, and Hamersley ranges. Rainfall is minimal and irregular and the climate is extreme with intense heat in summer and freezing temperatures in winter. Most of the plateau is uninhabited or very thinly populated with a density of just one person per hundreds of kilometers. The kangaroo, a native Australian mammal, has powerful hind legs that allow the animal to jump as far as 5 m (16 ft) in a single leap. Its tail, which may be as long as 1.5 m (4 ft), is used for balance while jumping. 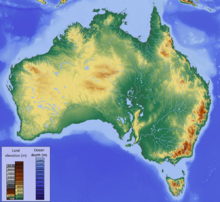 Though there are climatic differences among the regions of Australia, the continent does not experience climatic extremes. Northern Australia is tropical, while the southern region is temperate. Nearly 40 percent of the land area has only two seasons—a hot, wet season and a warm, dry season. Uluru, also called Ayers Rock, is considered to be the largest individual rock mass, or monolith, in the world. Located in central Australia, the monolith measures about 3.6 km (2.2 mi) long and 348 m (1,142 ft) high. Rock paintings made thousands of years ago by Aboriginal artists cover the walls of many caves in Uluru. Slightly more than 100 km (60 mi) south of Tennant Creek, in the most sparsely settled section of Australia’s Northern Territory, lies the bizarre rock formation known as the Devil’s Marbles. These massive spheres—the only formation of this kind in the world—were weathered away to their present form by erosion. Aboriginal Australians regard the mysterious Devil’s Marbles as sacred. Lake Eyre is a vast salt lake in the arid interior of South Australia. Although many intermittent rivers flow into the lake, the water often evaporates, reducing the lake to a dry salt pan for much of the year. .Australia is world famous for its natural wonders and wide open spaces, its beaches, deserts, "the bush", and "the Outback". Australia is one of the world's most ....Become inspired to travel to Australia. Discover fantastic things to do, places to go and more. Visit the official site of Tourism Australia here..Entry point for all Australian Commonwealth Government authorised information and services.